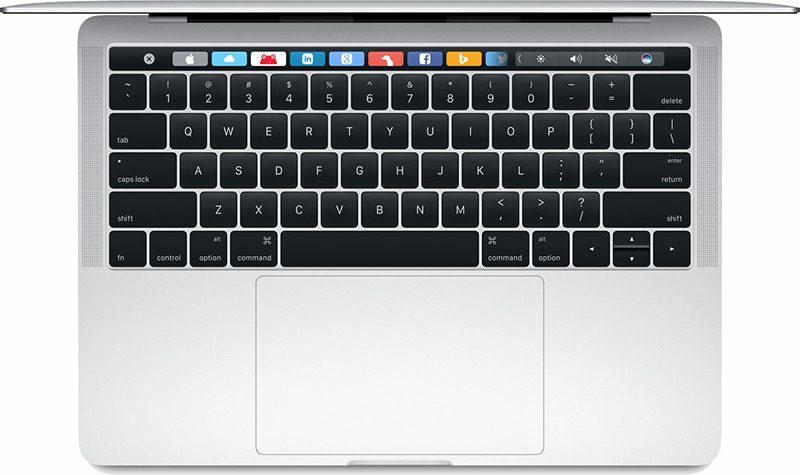 Apple today launched a keyboard repair program for MacBook and MacBook Pro models equipped with butterfly keys to address complaints over letters or characters that repeat unexpectedly, letters or characters that do not appear, and keys that feel "sticky" or do not respond in a consistent manner. According to Apple, a "small percentage" of MacBook and MacBook Pro keyboards from 2015 to 2017 can experience these symptoms. Apple says that customers can bring an affected MacBook or MacBook Pro into an Apple retail store or to an Apple Authorized Service Provider to receive repairs free of charge, with the type of service to be determined after the keyboard has been examined. No other MacBook or MacBook Pro models are included in the program, but it does cover eligible MacBook and MacBook Pro models for four years after the first retail sale of the unit. To initiate the repair process, customers should find an Apple Authorized Service Provider, make an appointment at an Apple retail store, or mail the device into an Apple Repair Center after contacting Apple support. Apple says that if the affected MacBook or MacBook Pro has damage that impairs service, the issue will need to be repaired first. Repair documents for Apple Authorized Service Providers seen by MacRumors suggest Apple will repair MacBook and MacBook Pro regardless of keyboard damage due to attempted keycap repair by the customer or physical top case damage unrelated to the keyboard. Liquid damage and physical keyboard damage unrelated to a keycap repair will require additional work to be paid for by the customer before a keyboard repair can be initiated. Customers who experienced keyboard problems but were forced to pay out-of-warranty repair fees for their damaged MacBook or MacBook Pro models can contact Apple to inquire about a refund. In some cases, repairs for keyboard issues were priced at upwards of $500. Apple's decision to offer a repair program follows increasing customer dissatisfaction with the failure rate of the first and second-generation butterfly keyboards in the 2015 and later MacBook models and the 2016 and later MacBook Pro models. Customer complaints have suggested that these models experience issues more often than prior keyboards due to the flatter butterfly keys that adopt dome switches for a more responsive feel. The design of these keyboards can cause keys to fail when dust or other small particles get into the keys, leading to the "sticky" and non-responsive keys Apple describes above. Apple is facing two potential class action lawsuits over the defective keyboards in recent MacBook and MacBook Pro models from customers who were forced to pay high prices for out-of-warranty repairs. Thousands of customers also signed a Change.org petition calling on Apple to fix the keyboard issues that are being addressed with the new repair program. Ever since Steve Jobs died, and Bob Mansfield was replaced by an iPad guy (Dan Riccio) in late 2012, Mac designs have gone downhill. Plain and simple. Surprise, surprise. There IS something wrong with the keyboards like we all knew there was. Typical Apple - blame their customers, blame their users blame EVERYBODY else but their poor design choices. It’s brilliant that they finally started a free repair program for this. Many people thought they wouldn’t but it was starting to get out of hand. Although it shouldn’t have been an issue in the first place. The 2018 models don’t have this issue due to the mechanism used. The 2018 models don’t have this issue because they don’t exist. Regardless of what the haters will say, this is good customer service. Thank you Apple! I have a distorted view of good customer service. My definition of "good customer service" entails a company making good on addressing a manufacturing defect without the need to threaten a class-action lawsuit. But I'm odd that way. The 2018 models haven’t been announced or released. Apple and their customers would better served if they would be more proactive about fixing these issues before they blow up into these huge news stories and lawsuits. They like to talk about how important their customers are to them, but when looking at situations like this I have my doubts. They'll go out of their way in some situations and completely fall flat on their face in others. They'll design world-class hardware for iOS devices and yet can't even get a keyboard right for the Mac. It's bizarre and shows that their priority is not the Mac—despite what they say! What the heck is going on, Apple? Well it won’t be long before a redesign now. I can’t imagine they will keep selling laptops that have to be covered by a repair program. Hopefully updates soon!